‘In the second year of the course Photography was part of the syllabus and this was geared particularly to Advertising Design and Photography. The technical processes of photography were taught and this is where Tony began to learn the basic techniques of the craft. ‘At this time I don’t believe he owned a good camera and the amount of time spent in the photographic section was limited to about one day per week plus an evening class at the best.’Tony bought a camera, a Rolleicord I think, which caused him some concern. Something was at fault in its manufacture with the result that things that registered in focus on the viewfinder did not correspond to the focus of the lens. All the photographs were fractionally out of focus. I can remember him fuming in the darkroom, examining the enlarger and his developing procedures and saying how awful his work was. 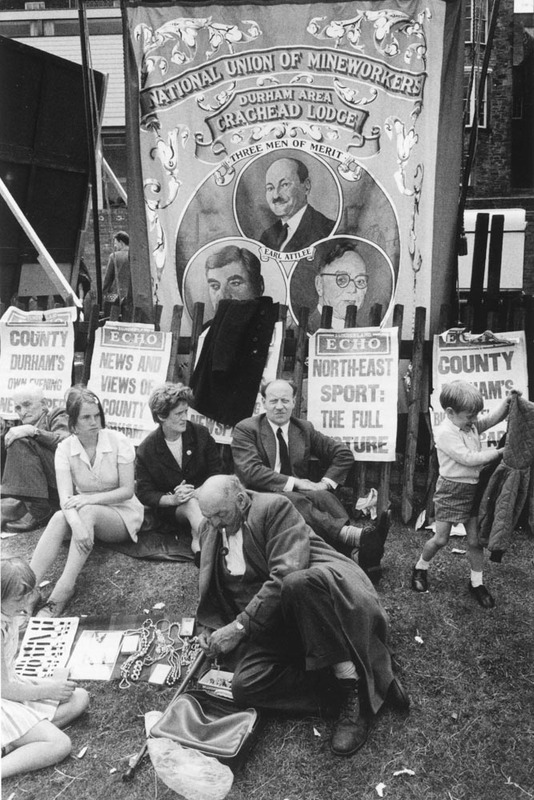 Durham Miners’ Gala, 1969, by Tony Ray-Jones. These remarks all point to a feature of Tony’s work which it is important to bring out. He was a craftsman before all else. He worried constantly whether there was something in the chain of processes between the subject and the final print which might not be improved. He consulted the Editor of The British Journal of Photography, not only on the best lens he could use for a particular problem but on the possibilities, which haunted him, of making a master print from which, he hoped, exact and perfect copies might be made for future use. The technical drawbacks of this idea were explained to him. The perfect print, the best that could be achieved from his negative, was just one side. but a revealing one, of his craftsman’s passion for the ultimate in his work. He won a scholarship to Yale University for graduate work in design. He studied at Yale in 1961-62 before working with Brodovitch up till 1964. He then freelanced in America for the next two years. His contract with America was all-important. America turned him on. And in a particular way it matured his vision, stimulated and infuriated him, immersing him in a love-hate relationship that developed him as a photographer and as a person.